When a fire damages your home, the fire damage restoration experts from ServiceMaster Cleaning & Restoration Services will be there for you every step of the way. 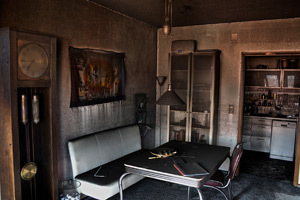 Our job is simple to describe, we remove smoke, soot, and other secondary fire damage from your valuables. It can be a complicated process, as many different materials require different cleaning procedures due to chemical reactions and compounded soot. The best way to keep your prized valuables safe in the event of a fire is to not keep them within your home. Put your critical documents, jewelry, and family heirlooms in a safety deposit box. Back up your most valuable computer files and data onto a cloud-based storage system or on multiple flash drives. There is a very simply solution to keeping your most valued items in tact during a fire in your home, that is to invest in a fireproof safe. Critical documents, heirloom jewelry, computer files, and other treasured valuables, should be kept in a place that protects them not only from fire, but from theft and water damage as well. A high-quality fire and waterproof safe can plenty when it comes to protecting your most valued possessions. If you’ve already experienced fire damage to your home, time is of the essence. The longer your house is covered in soot, the increased possibility of damage. We don’t recommend you attempt to do any restoration yourself as soot may contain dangerous chemicals. The professionals at ServiceMaster Cleaning & Restoration will evaluate your home and attempt to restore all salvageable items. If you’ve experienced a fire in the Somerset, NJ area, call ServiceMaster Cleaning & Restoration Services. We’ll help cleanup your property and rescue as many items as possible during the process.